One of my favourite bits of magic is on the country lane that goes up from El Mocanal to the road to the village of San Andrés. I said "up" because it really climbs steeply past the houses of the hamlet of Betenama before arriving at a relatively flat area with incongruous palms standing high on the left. The lane then climbs again through abandoned walled fields and dispersed stands of evergreens - what remains of the laurisilva forest that once clothed these slopes. As the vegetation becomes denser, you’ll see on your right a wood of Canary “beeches”. On first sight it is a little disconcerting: the trees have straight trunks with no sprouts, quite unlike the beeches in the evergreen forest that look coppiced. The more you look, the more the little wood casts its spell on you. As your eyes become used to the contrast of light you’ll make out sheep grazing on the grass and ferns between the rocks and, perhaps, some way off and camouflaged by the play of light and shadow, the white mare. A scene worthy of Samuel Palmer. 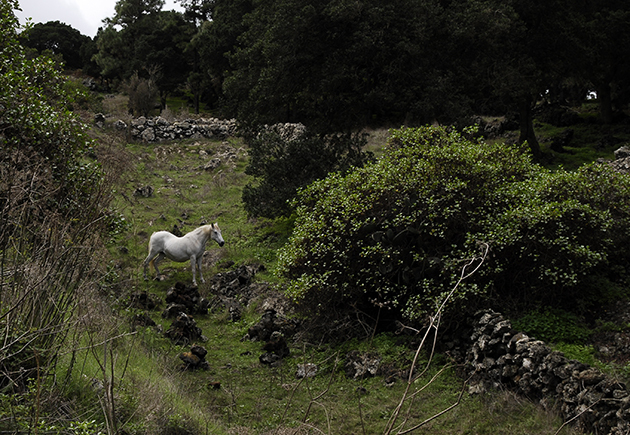 The white mare has lived in the wood for many years, at least sixteen, and she is getting old. Her back sags a little from bearing a foal every year or two, sometimes white like her, long legged creatures that skip around her and disappear on the first weekend of June. When I pick up my younger grandchildren from the airport we always drive home this way. We stop and call out to her. Sometimes she comes but most often pays us no attention at all. I tell them she is a unicorn and only a pretty little girl can tame a unicorn. If a grandson says in petulance that she hasn’t got a horn, I reply he can’t see it because he doesn’t believe. I, of course, have seen her horn on several occasions. The Unicorn in the gully between the road and the enchanted wood. If you can't see her horn, you know why!